The title and subject of one of Tennyson's best-known poems. It is loosely based on the figure of Elaine, the Fair Maid of Astolat in Malory, book XVIII, chapters 9-20. After losing the Grail quest, Lancelot returns to Camelot. Arthur decrees a tournament at the land of Astolat, identified by Malory with Guildford. 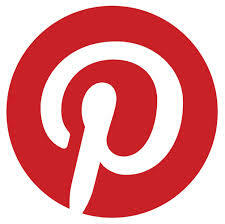 Lancelot follows incognito, unwilling to stay home with Guenevere and cause more suspicion. While in Astolat, he lodges with the baron Bernard, whose daughter Elaine falls in love with the knight. 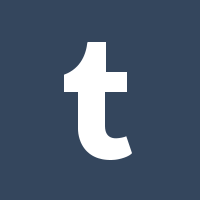 He wore the armor of Bernard's son Tirre, and the token of Elaine--a red sleeve embroidered with pearls. During the tournament, Lancelot is gravely injured, his liver punctured, and goes back to Bernard where he is nursed by Elaine. She finally tells him of her love, and he refuses her. Devastated, she dies of a broken heart, and per her instructions, her family set her in a barge down the Thames. She is found by Arthur and Guenevere, the latter of whom is furious until she reads that Elaine died a virgin. Lancelot, filled with guilt, gives Elaine a lavish burial. 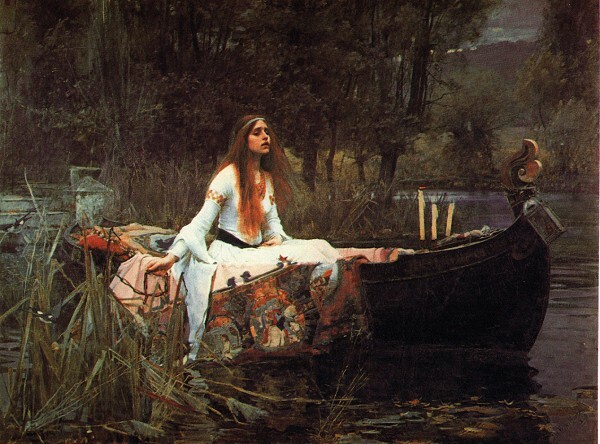 Tennyson retells this story faithfully in his Idylls of the King, but changes it radically in "The Lady of Shalott." 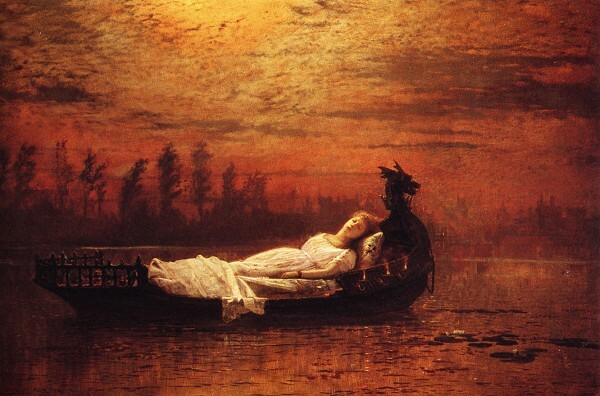 Here, Elaine (unnamed) is under a fairy spell on the Island of Shalott. She is imprisoned in a tower, and commanded never to look out the window, but to only a mirror which reflects the outside world. She is to weave a tapestry from what she sees in the mirror. One day she sees the reflection of Lancelot. His beauty causes her to turn around and look at him with her own eyes--and thus bring about her doom. Realizing this, she takes her tapestry down to a boat, lays herself into the boat, and dies while sailing down the river towards Camelot. The court sees her, and brings the boat to shore. Lancelot remarks on her beauty, and prays that God give her mercy. On her album The Visit (1991), Loreena McKennitt sets Tennyson's ballad to music. The editors at AllMusic.com point out that the song "utilizes an opening melody lifted -- probably unknowingly -- from the bagpipe solo at the end of AC/DC's 'It's a Long Way to the Top (If You Wanna Rock 'n' Roll),'". I have to admit, I didn't realize this. She is also the subject of numerous paintings, illustrations, and a fairly well-known song based on Tennyson's poem. 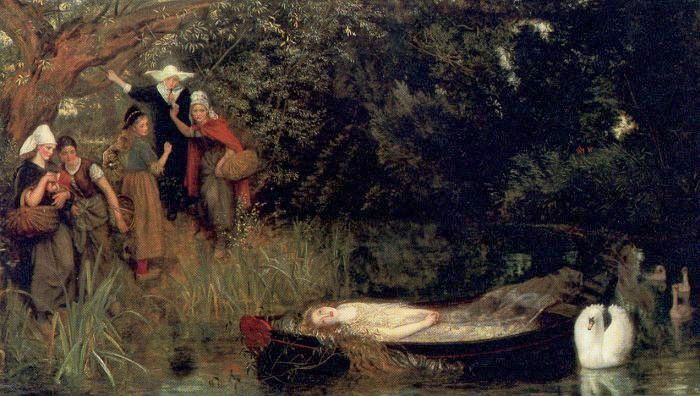 Of the paintings, I will only focus on those most famous, as to examine every depiction of the Lady of Shalott would be difficult, as I have yet to see a full catalogue. 1888: "The Lady of Shalott"
The most famous depiction of the Lady, here seated in her boat, setting loose the chain and preparing the sail towards Camelot. The landscape, though green, is dark, as if a storm is about to begin; some light is seen over the mountains, where clouds gather. Here, our Lady is dressed in white, with long red hair and a distraught look upon her face. She sits on one of her tapestries, which is partially floating in the water. Three candles are on the bow; all but one has blown out, the the final one is in the process of being blow out. A crucifix lies beneath the candles, but her gaze is on the water. When I was in college (the late 1990s), it seemed as if a poster of this particular painting was given to every incoming freshman girl as she moved into the doorm. It's not hard to imagine why--here is unrequited love at its most tragic, and frankly, melodramatic. Not unlike a teenage girl, myself included. This particular painting is on display at the Tate in London. In person, the details become much more impressive, no doubt due to its massive size (153 x 200 cm). 1894: "The Lady of Shalott"
Another well-known version, again by Waterhouse, features the Lady still in her tower, but now aware, stooping over as if hearing something. Again she is dressed in white, but the model is obviously different, and her hair is dark and pulled back. 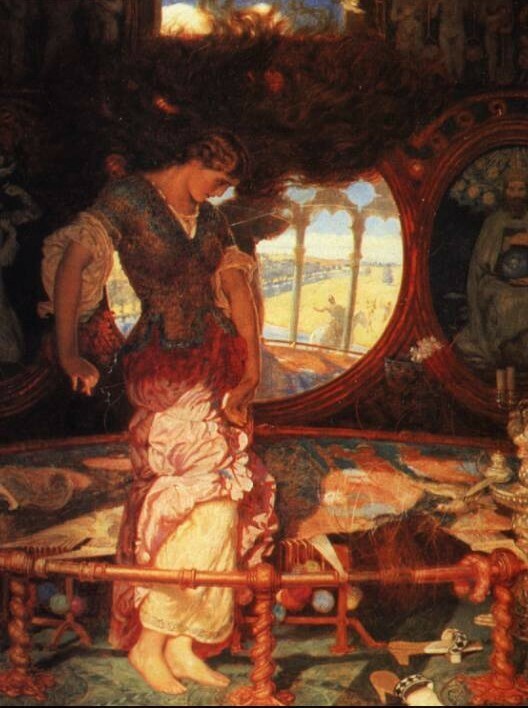 The same tapestry is seen in the background, which is a claustrophobic cell, wherein we see the Lady's mirror. She has turned away, and is looking out the window to Lancelot, who is riding by, unaware of her. Balls of yarn have fallen to the floor. Here, the Lady is seen weaving one of her tapestries, eyeing the loom intently. We see her mirror, her cramped cell, same as before. She is wearing red, however, a more vital color, and we can see people passing by her window, reflected in the mirror. 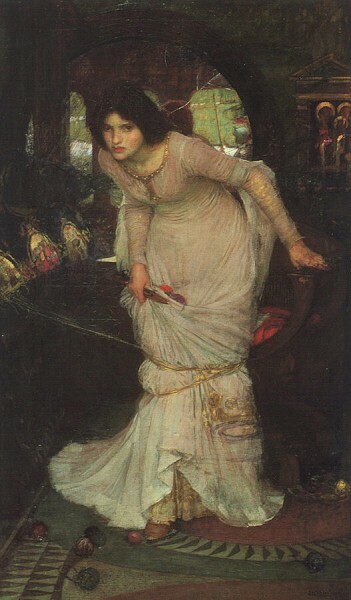 What is most interesting about Waterhouse's Lady is that despite the different models, each figure comes across as a sturdy, even serious young woman, fully aware of her curse. I find odd the dragon-head on the funeral boat, which would seem more appropriate if this were a Viking funeral. Otherwise, there is an interesting contrast created with the warm colors enveloping the dead woman. In an ornate chamber, decorated with images of angels, fruits, trees, and other such things the Lady cannot go near, she stands inside a ring, seemingly entangled by one of her tapestries. She is barefoot, dynamic, in the middle of turning, perhaps away from the mirror facing us the viewers, and out towards the window towards Lancelot. Like Waterhouse's 1916 version, this Lady is active, aware, and making the most of her fate. The Lady, dead in her bower, is found seen by women who stand upon the bank with sad looks on their faces. The Lady is a ghostly white, while the women are in robust colors. Not my favorite, but worth noting. 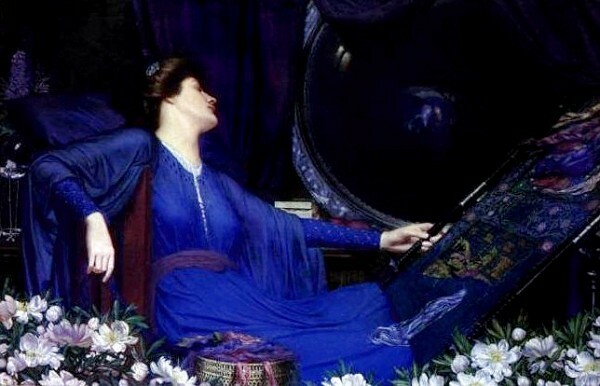 Here, the Lady is lounging in a chair, seemingly asleep, as a figure is seen in her round mirror. 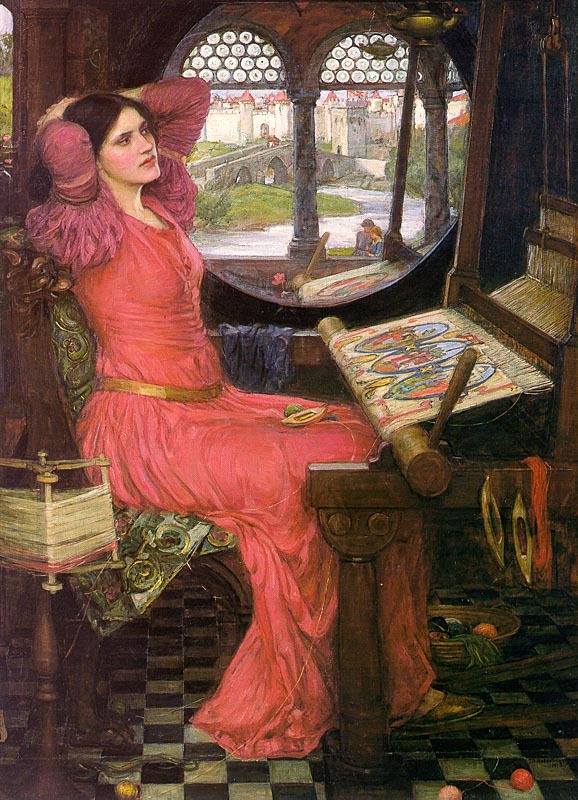 Like other depictions, the scene is both claustrophobic and lush with color; she sits before her loom, and is surrounded by flowers. 1858: "The Lady of Shalott"
Like Waterhouse's 1894 piece, this depicts the Lady having turned from her work and her mirror to gaze on Lancelot's actual form, thus triggering her death. 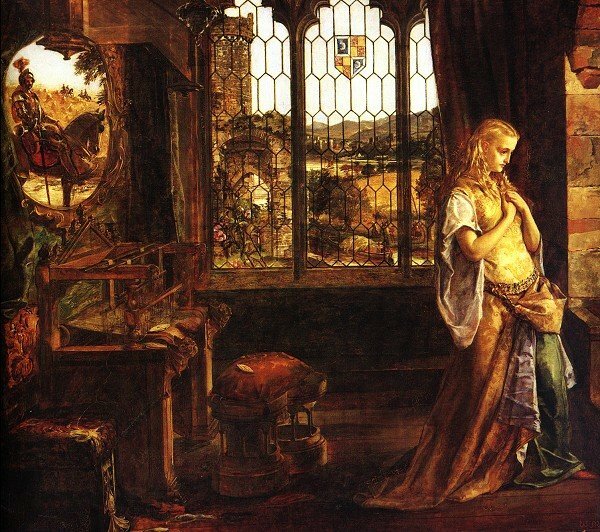 While lush, it doesn't work as well in depicting the Lady's captivity, nor her curse; there is a very large glass window which takes up much of the background, and which is not the window she is gazing from. Ultimately, while very pretty, it doesn't accurately reflect the poem. Many of the images for these paintings can be found at this website: The Lady of Shalott. 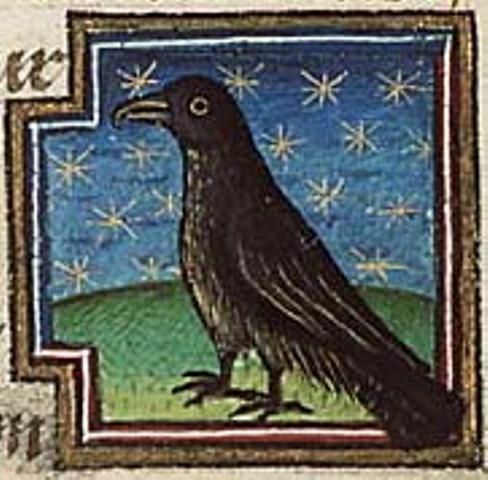 There are also numerous other illustrations found at the Camelot Project.